This is a recap of the most interesting news and discussions relating to Parkinson’s Disease this past week. 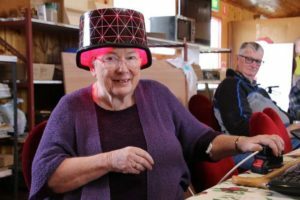 We saw people with Parkinson’s in Tasmania (Australia) turning heads with the latest Parkinson’s Disease fashion trend, wearing red light buckets on their heads. They say it helps improve their symptoms. We saw study results that told us that while research on the gut bacteria/PD connection continues, we should also be aware that gut bacteria can interfere with levodopa treatment. Rock and roll legend Peter Frampton was diagnosed with Inclusion Body Myositis, a rare disease that based on some of the symptoms, could be misdiagnosed as Parkinson’s Disease. Those are just a few of the hot topics from last week.